Robin Nolan The Gypsy Jazz Volume 5 PDF + Mp3 CD download. The RNT books have become an essential item in any guitarists gigbag wishing to learn the Gypsy Jazz style. They cover all the great tunes played by Django that are the standard repertoire for anyone playing this genre of music. Their main advantage over many other books is their accompanying CD which firstly gets you in tune and then takes you along with Robin Nolan and Paul Meader as they play the melody for you, then the melody drops out and they carry on playing the backing rhythm for you. They are great for jamming along to also if you don’t have a rhythm guitarist to back you up. All authentic gypsy chord shapes are covered and clearly laid out for you to learn before firing up the CD player. The melody is laid out in Tab format for ease of learning. Suitable for beginners to well practiced players. 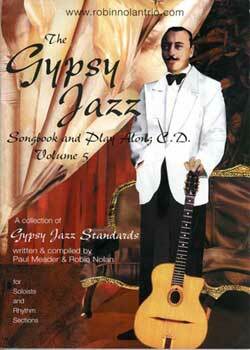 Download Robin Nolan – The Gypsy Jazz Volume 5 PDF free and other books from our site. Only high quality PDF scans. Please write a review, it's important for our community.